Lichen is actually two types of creature, rolled into one � the alga provides the fungus with food while the fungus offers the alga a cosy living environment. Image: L Sancho. 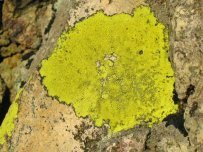 A lichen is a symbiotic relationship between a fungus and an alga. Every lichen (pronounced 'like-en', not 'litch-en') consists of a fungus, which usually makes up the main body or thallus, and an alga, whose cells grow in among the threads or hyphae of the fungus. The alga, which possesses chlorophyll and carries out photosynthesis, does most of the work, producing simple sugars and vitamins for the lichen's collective metabolic pathways. The fungal cells absorb nutrients from water, given the lichen a definite structure, and protect the algal cells from environmental extremes. The fungus is usually one of the Ascomycetes (sac-fungi) that produce spores in closed sacs. The alga is either a green or a blue-green species. 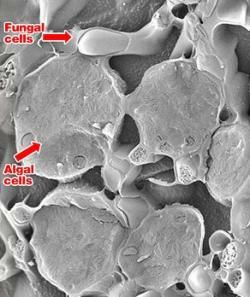 Many of the algae can, and so, exist separately in nature, but the fungi have never been found alone. Lichen are generally low-growing, vary in color from bright orange or yellow to gray or black, and are often found growing on rocks and tree bark. Although found throughout the world, they're unable to survive where the atmosphere is polluted so are good indicators of clean air. The dual nature of lichens was first realized in 1867 by a Swiss naturalist called Schwendener. • Fruticose. The thallus is bushy and branching, attached only at the base, and stands out or hangs down from the surface it grows on. • Foliose. The lichen creeps over the surface, but can easily be detached from it. • Crustose. Lichens of this type are closely applied to rock or bark, and cannot be removed from it except by brushing or scraping. Some of them look rather like dried paint. Lichens are reproduced by minute, dust-like spores, which are carried in the air and germinate if they fall in a suitable place. The spores come from the fungus, and are like those of ordinary fungi; the alga plays no part in their production. These spores will grow into fungi if they are cultured on nutrient jelly; in nature they germinate as fungi, but will not continue to grow unless they encounter suitable cells from the many algae which grow independently. The spores of a lichen are usually produced in a small, cup-like structure called an apothecium. Some lichens also reproduce by producing little powdery granules, consisting of a scrap of fungus hyphae with some alga cells entangled in them. Such a granule is called a soredium, and can grow into a new lichen. Lichens are extraordinarily slow-growing, and are also among the longest-lived plants. This applies especially to the encrusting, or crustose, lichens that grow on rocks. The thallus of Rhizocarpon geographicum increases about 2 centimeters in diameter over 100 years; patches found growing on rocks in the arctic regions must, by their size, be many hundreds of years old. There seems no reason why they should not go on growing indefinitely. Although the rate of growth is very slow it is quite constant and this fact has been used to estimate minimum ages for glaciers, ancient monuments, and other objects. Lichens are of great importance in soil formation. By breaking down the rock surfaces they pave the way for mosses and higher plants. In cold regions like the tundra they are important as food for animals such as reindeer and caribou. The Reindeer moss of Lapland is fruticose lichen of the genus Cladonia. In the past, lichens have been a valuable source of permanent dyes but this industry has been replaced by the synthetic dyes. Litmus, the indicator used to show acidity or alkalinity in the laboratory, was originally obtained from a lichen. Lichens are the most complex form of life known to have survived prolonged exposure to space. In an experiment led by Leopoldo Sancho from the Complutense University of Madrid, two species of lichen – Rhizocarpon geographicum and Xanthoria elegans – were sealed in the Foton M2 capsule and launched on a Russian Soyuz rocket on May 31, 2005, from Baikonur Cosmodrome. Once in Earth orbit, the lid of the container opened and the samples were exposed to the space environment for nearly 15 days before the lid resealed and the capsule returned to Earth. The lichens were subjected to the vacuum of space, unshielded solar ultraviolet radiation, and temperatures ranging from -20°C on the night side of the Earth, to 20°C on the sunlit side. Surprisingly, they survived apparently unscathed. In space, the lichens became dormant and did not metabolize. However, back on Earth, they resumed their normal activity and their DNA appeared not to have been damaged. All of the lichen appeared to endure the ultraviolet radiation, even those receiving the most exposure. Lichens have a tough mineral coating that could shield them from UV rays. They are also made from individual organisms layered on top of one another, so outer layers may provide protection for underlying cells. The experiment adds weight to the theory of panspermia – that life could be transported between worlds, perhaps by hitching a ride on an asteroid. It also indicates that organisms similar to lichens might be able to survive on the surface of Mars. Although the martian atmosphere is very thin, it is composed mainly of carbon dioxide, which is necessary for lichens' photosynthesis. The lichens might not survive on Mars for long, however, because of low oxygen levels in the atmosphere. In the 1980s, experiments carried out on NASA's Long Duration Exposure Facility satellite showed that certain bacteria are hardy enough to endure space.